Underneath Coleman’s classic Cadillac is a relatively original chassis. 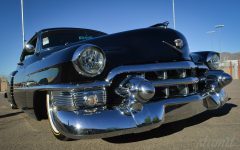 The ’53s frame was left intact, with minor modifications to the front and rear suspension configuration. 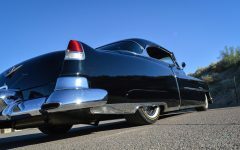 In the rear, a 4-link suspension was welded in place. 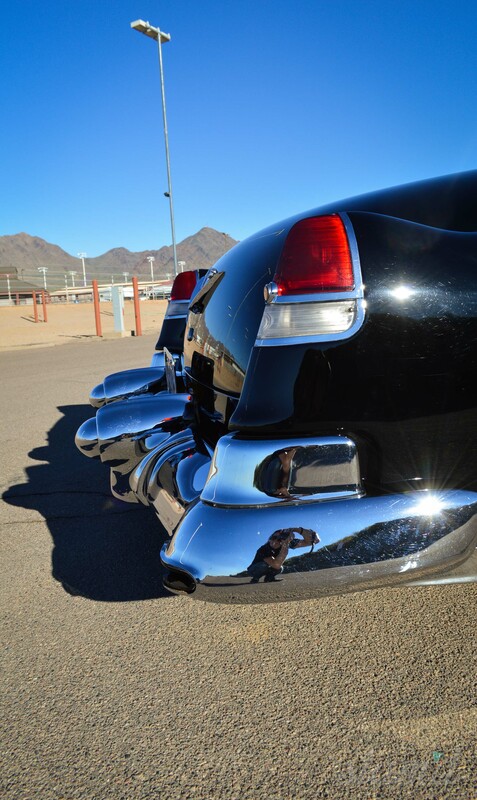 Housed by the 4-link, is the donor Escalade’s Posi-Trac rear diff. 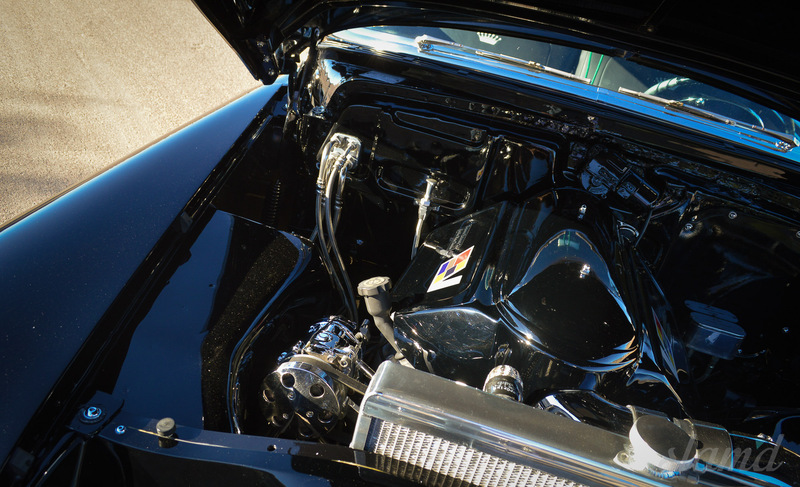 The GM unit features 3.73 gears and was narrowed by a total of five inches to sit properly in its new home. 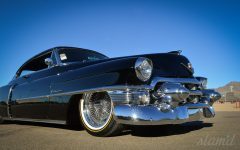 Making possible the ideal Slam’d stance on Lee’s Caddy, is a Ride Pro 2 kit from RideTech. 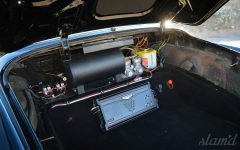 The kit includes both front and rear ‘bags for the chassis to float on, as well as dual Viair 480 compressors. Lee’s “2 Tons of Fun” is a stellar example of classic styling. 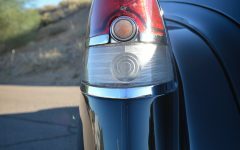 Its timeless aesthetic is largely aided by the period-correct custom wheel choice. 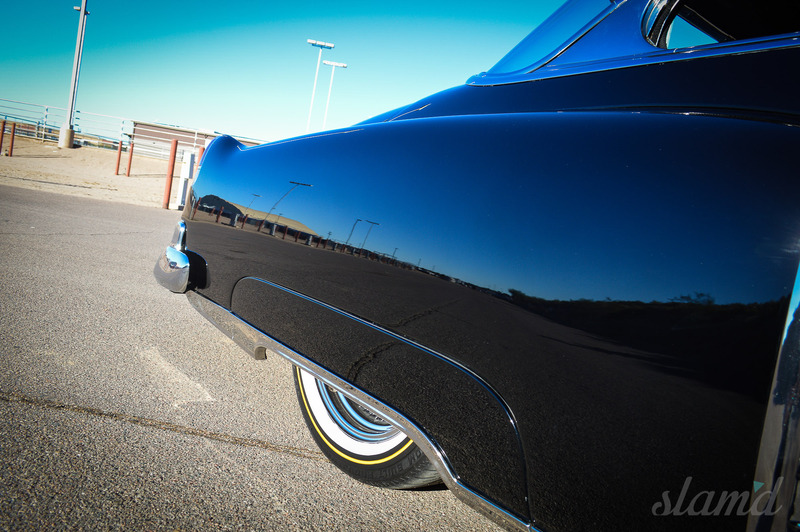 Deep beneath the fenders are 17-inch Dayton rollers. 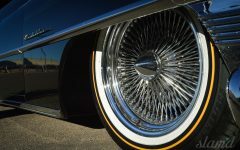 The high spoke designs are mirror polished and paired with Vogue white-wall and gold-striped tires. 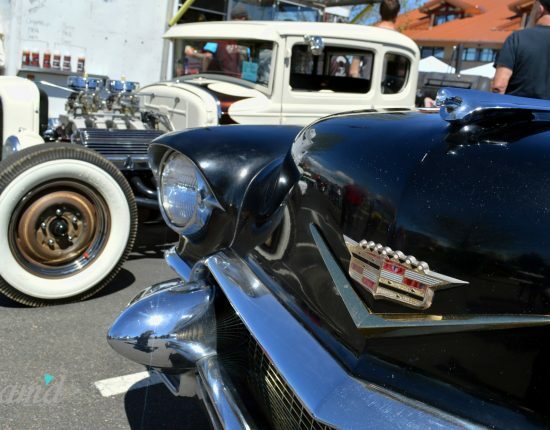 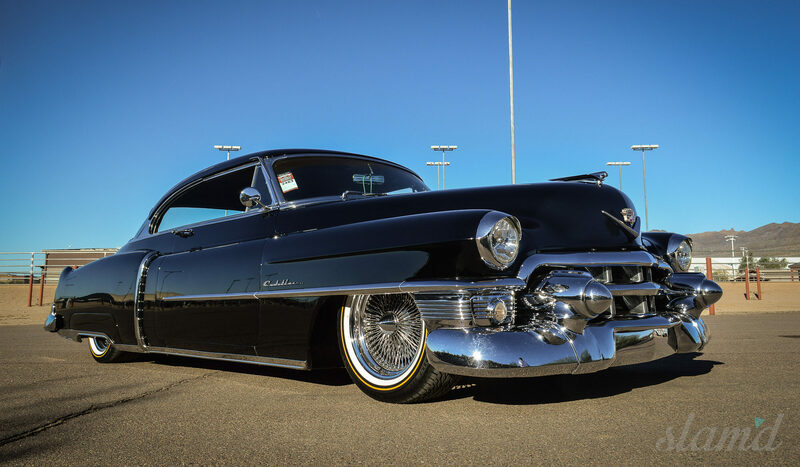 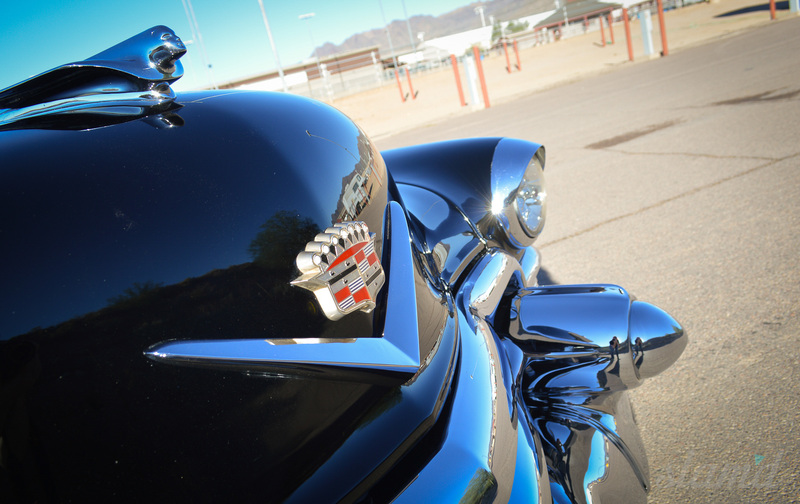 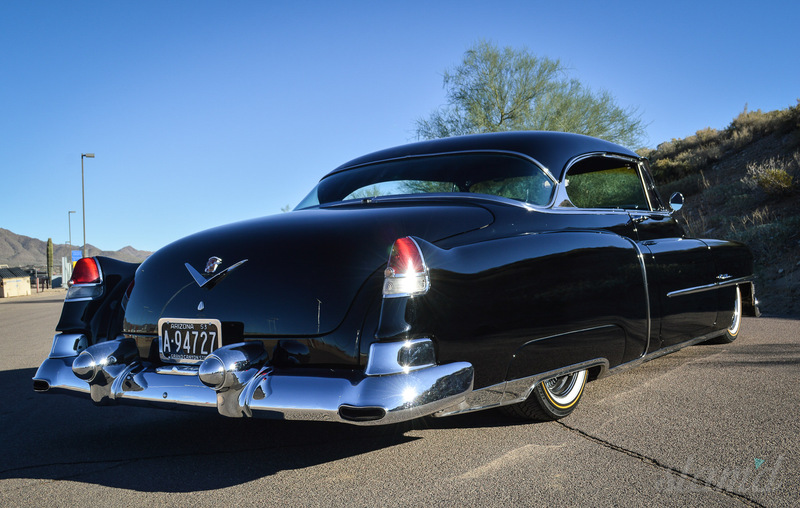 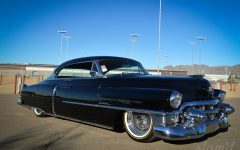 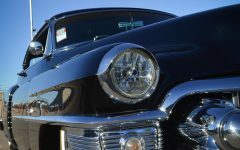 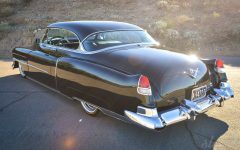 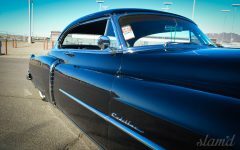 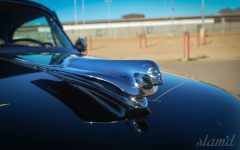 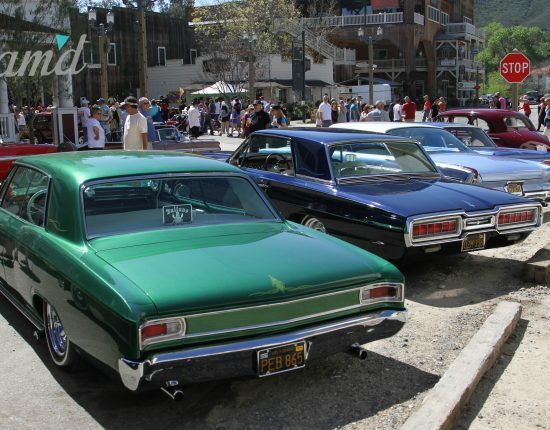 The combination is a signature style of custom Cadillacs; One which Lee notes receives nods of approval from both the Hot Rod and Lowrider communities. 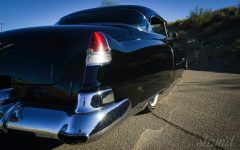 Bringing the vintage rolling attire to a halt, are the factory 13-inch, 6-piston brakes contributed by the Escalade running gear. Lighting up the rear wheels at will is a modern Cadillac heart: a 6.0 HO Vortec V8. 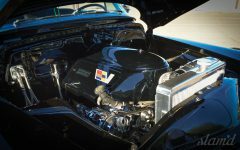 The Cadillac variant of the LS style small-block was specially engineered for its application, making it the perfect modern transplant for “2 Tons.” Pushing power through the 4L60E trans, the motor provides seemingly endless torque, allowing Lee’s Caddy to cruise powerfully and reliably. 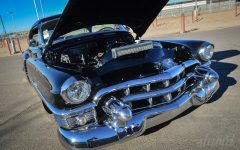 The engine features a signature sound, brought about by a custom exhaust which has been coated in Jet Hot ceramic material. The bodywork of Lee’s Slam’d ride has been finished outstandingly by El Camino Paint & Body in Phoenix, AZ. 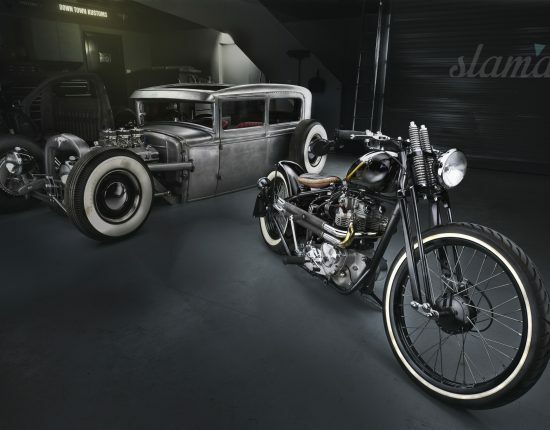 The beautiful factory styling that Lee adores, was brought back to life with careful attention to detail and skillful sheet metal fabrication. The ’53s copious amounts of chrome have all been restored to their former glory, contrasting dramatically with the Jet Black paintwork. 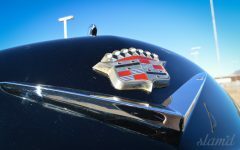 Still sporting its original badges and hood ornament, the classic Cadillac is a time capsule of the golden age of American Design. 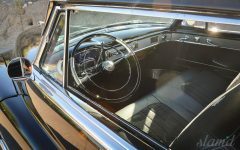 The interior, very much the same as the exterior, features finely tuned modifications with a restorative approach to styling. 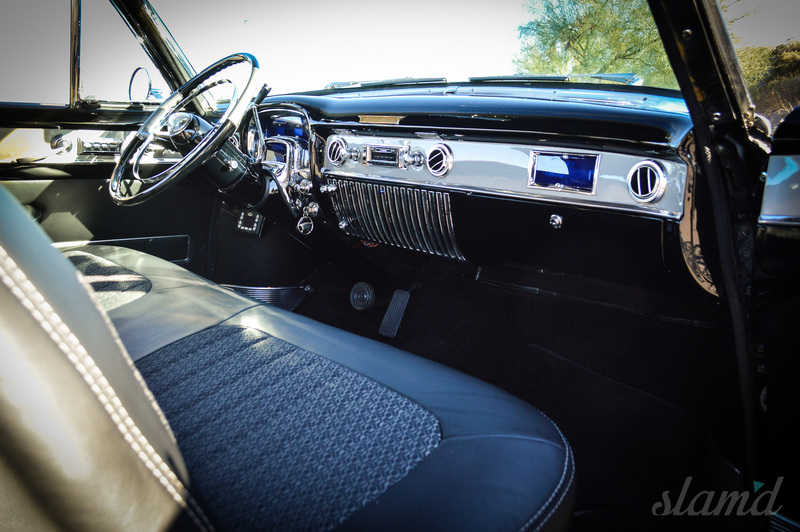 The original seats have been made new with a black leather upholstery. 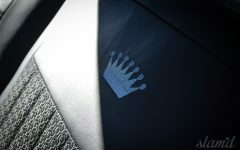 The seat inserts have been replaced with Ciadella custom fabric for an authentic match. The rest of the interior has also been correlated to its 1953 design, using new leather wrappings on the door panels and headliner, along with new black carpet throughout. 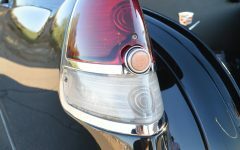 The dash has been paint-matched to the exterior’s Jet black finish and highlighted with Cold Grey, achieving the same brilliant contrast with the interior chrome trim. 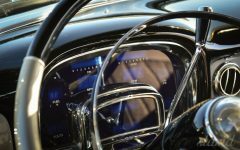 At first glance, all of the radio controls, gauges, and HVAC controls appear to be untouched. 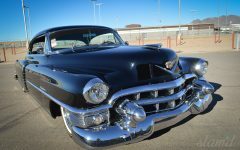 They have, however, in congruence with the entire build, been modified to combine modern convenience with an original appearance. The gauges were customized by Dakota Digital to feature their Odyssey Series II cluster in the factory housing. The HVAC controls have been wired to a Vintage Air Super Gen II system. 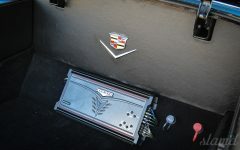 The factory headunit was replaced with a Custom Autosounds piece. 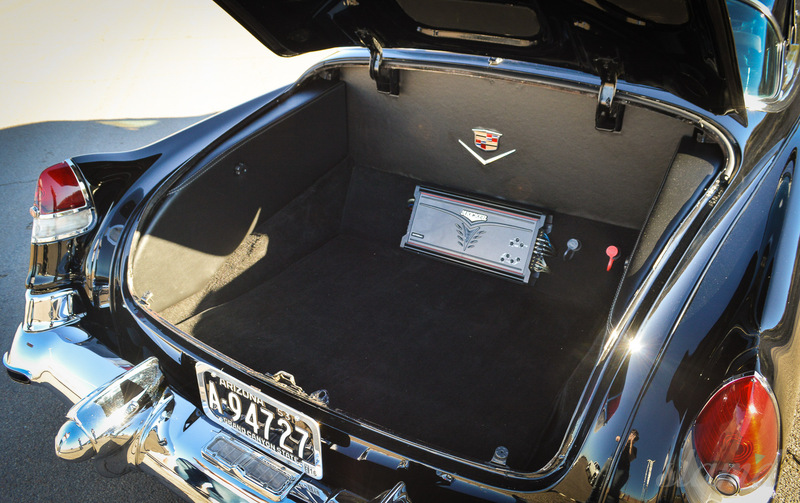 The sound travels to a Kicker 5-channel. 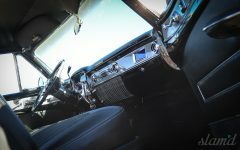 Tucked in the cabin are two 6-inch Pioneer ST series mid speakers and three 6-by-9-inch ST highs. 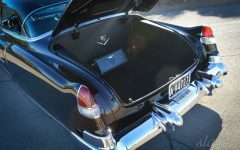 The bass arrives courtesy of dual 10-inch Pioneer ST subwoofers mounted in the trunk. “2 Tons of Fun” is a seamless connection between the glory days of 1950’s hot-rodding and modern, powerful engineering. 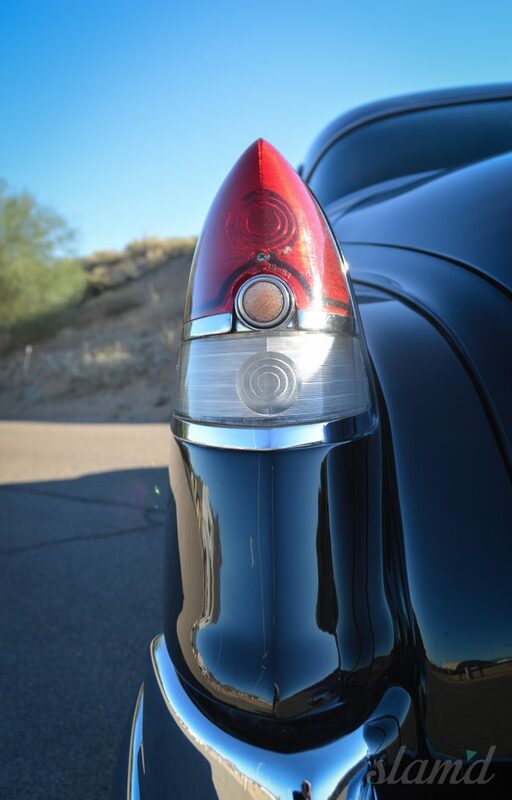 The Cadillac keeps it in the family with its contemporary power-powertrain, honoring the legacy of Lee’s favorite Cadillac designer, Harley Earl. 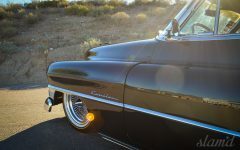 Lee’s ongoing project is one of passion, achieving his dream with every added customization. 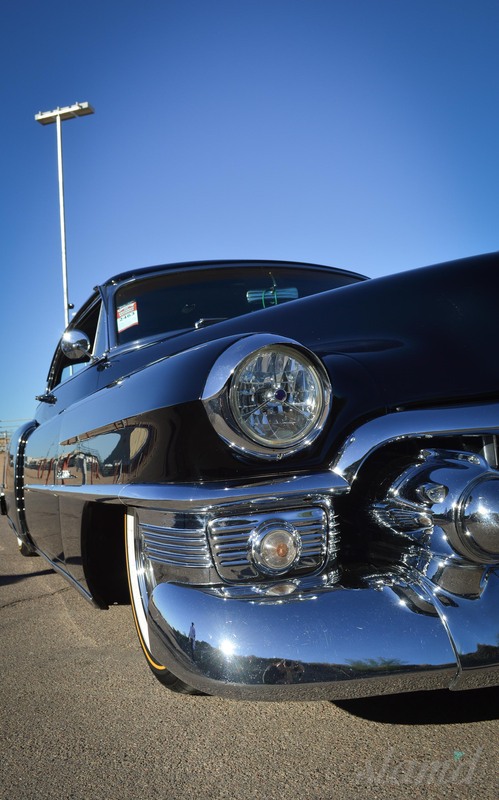 It’s a labor of love as he continues to button up the Caddy and finish off his vision. 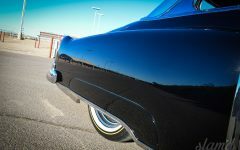 Despite’s its current “ongoing” status, the 53 looks mighty fine from where we are standing – great work Lee!